Description: Two standard cab Dash-9s and a widecab Dash-9 lead an eastbound mixed freight out of Enola Yard. 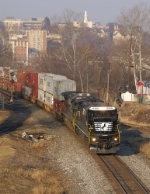 Description: EB doublestack/intermodal (Train 20G) past signal 48 on the NS Lehigh Line, Main Street, 0918 hours. 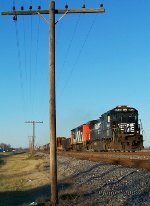 Description: UP Train MPIPB 01 with NS and CN Power comes through Stoddard Street on our way back from Illinois. Description: Screaming through Bernie with over 9,500 tons is UP Train MPIPB 01 with NS and CN Power. Title: My best railroad photo yet. Description: It's always nice to see something different other than blue and yellow! Description: Cloud boinked again on the NS 25A heading south on the New Castle District. 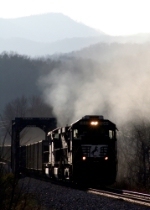 Description: Light tricky 352 runs the stretch between Reidsville and Danville. Evidence of long ago second main remains. Description: NS 22V with 8-40C 8309 and 9-40C 8844. Description: Crossing the Delaware River on the NS Lehigh Line on the ex-CNJ bridge at CP Phillipsburg, 0815 hours. The iron truss bridge in the background is the little used BDRV ex-CNJ bridge over the Lehigh River at S. 3rd Street in Easton, PA. The track going off to the right (NE) of the picture is the NS Washington Secondary. Description: 501 charges west through Pottstown past the old Reading Company station now changed into a bank of all things.